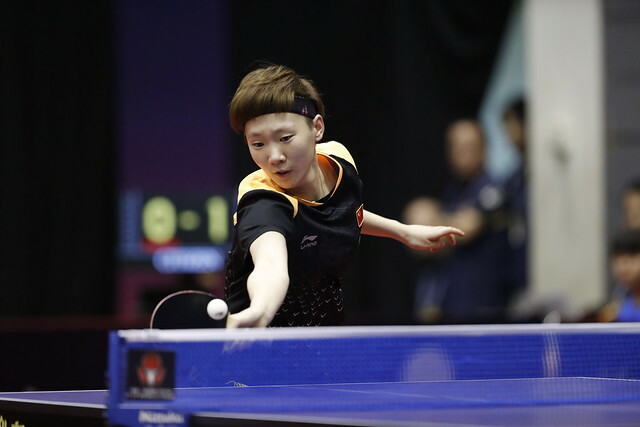 The surprise opening round winner one week ago in Shenzhen when beating Germany’s Timo Boll, one week later at the Seamaster 2018 ITTF World Tour Lion Japan Open in Kitakyushu on Friday 8th June, at the same stage of proceedings, once again he caused a major upset. China’s Liang Jingkun accounted for Hong Kong’s Wong Chun Ting, the no.3 seed (8-11, 11-13, 11-8, 11-7, 14-12, 11-3) in round that when compared with the previous week resulted in better fortunes for Timo Boll and most especially for compatriot Zhang Jike. Timo Boll proved too experienced for the host nation’s 17 year old Yuta Tanaka (13-11, 12-10, 11-5, 11-7); there was to be no Shenzhen repeat. Need for a rest, for Zhang Jike, it very much returning to action after a rest, beaten the previous week by Japan’s Tomokazu Harimoto; in Kitakyushu it would seem that the former Olympic and World champion is finding his feet. After a somewhat slow start, he found a rhythm to his play and eventually proved too fast for Denmark’s Jonathan Groth, the no.11 seed (7-11, 12-10, 11-6, 11-7, 11-8). Defeats for two seeded players in the guise of Wong Chun Ting and Jonathan Groth; there were defeats for three more. Most notably, Koki Niwa, the no.5 seed, suffered at the hands of in-form colleague, Kazuhiro Yoshimura (9-11, 11-8, 11-2, 11-8, 9-11, 11-7); Sweden’s Kristian Karlsson, the no.10 seed, lost to Germany’s Benedikt Duda (12-10, 8-11, 11-5, 11-7, 10-12, 11-7). Likewise, Korea Republic’s Jeoung Sangeun, the no.15 seed, departed at the hands of China’s Zhou Yu (12-10, 11-5, 11-3, 11-6). Success for Zhou Yu, as anticipated there was success for colleague Ma Long, the no.2 seed; he beat Chinese Taipei’s Chiang Hung-Chieh (11-2, 11-6, 11-2, 11-1). Emphatic from Ma Long; it was also impressive from Lee Sangsu, the no.4 seed, he defeated Lim Jonghoon (11-7, 11-8, 13-11, 11-13, 11-5) and thus reversed the decision of the previous week when at the quarter-final stage in Shenzhen he had been beaten by his Korea Republic colleague in four straight games (11-9, 11-9, 11-5, 11-6). Meanwhile, for the remaining leading names, with the exception of Wong Chun Ting and Koki Niwa, the first round hurdle was negotiated; Japan being very much to the fore and the Korea Republic the nation to suffer. Only Lee Sangsu remained. Tomokazu Harimoto, the no.6 seed, accounted for Jang Woojin (11-9, 11-8, 11-3, 11-6); Kenta Matsudaira, the no.8 seed, defeated Hwang Minha (11-8, 11-9, 11-5, 11-8). Following suit Frenchman Simon Gauzy, the no. 7 seed, ended the hopes of Jeoung Youngsik (11-9, 11-9, 8-11, 11-5, 3-11, 6-11, 11-4). The second round of the Men’s Singles event commences later in the evening.